In his book Linchpin: Are You Indispensable?, Seth Godin writes “Your art is what you do when no one can tell you exactly how to do it. Your art is the act of taking personal responsibility, challenging the status quo, and changing people.” Art, to Godin, concerns one’s job—practicing your profession with imagination, rigor, and autonomy. These qualities are also shared by artists. The connection between art’s role in the workplace can also be inferred. “Corporate art” can feel dull and opaque—a business sprinkling a body of artwork throughout the workspace. Such art can look and feel abrupt, for the artwork is suddenly on the wall. No context to why or how it was selected. It becomes shallow. No storytelling associated with the artwork in the lobby, hallway, wherever. A basic caption would suffice. The engagement lacked for something that took effort to acquire and display. 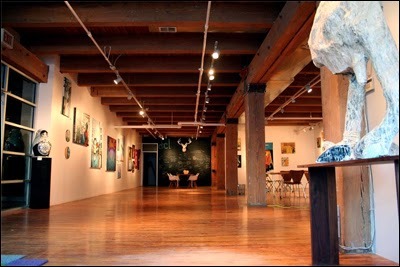 Here are a few companies who are exploring how engagement with art can be upped in the office. 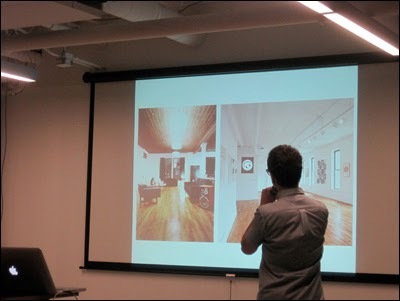 Chicago-based Web design and development firm Neoteric Design established an art-loan program. By-products include writing and publishing a how-to guide for other companies to adopt such a practice, in addition to sharing a meditation (above) on the work of one of the local artists they selected to emit stimulation. Pablo Picasso said, “Every child is an artist. The problem is how to remain an artist once [she or] he grows up.” The art-motivated business practices of Neoteric Design, Someoddpilot, Design Cloud, and 50,000feet, are efforts to sustain curiosity, not at the fidelity of childhood, but at the level of a worker who attempts to be active with an open imagination. Art can be viewed as a co-worker. It’s a visible colleague, maintaining its composure. Though silent, it invites contemplation and offers opportunities to exercise a variety of responses: emotional, intellectual, and overall, cultural. Art prompts exercise of the mind. Charles Darwin reflected, “If I had my life to live over again, I would have made a rule to read some poetry and listen to some music at least once every week.” Integrating art into one’s life or career, as Darwin aspired to do, supports the positive influences that art can facilitate and steer, especially in the workspace. Art is tangible but it helps fortify precious intangibles, from curiosity, as stressed by Picasso, to moments of quiet (and disquiet) as prescribed by Darwin. Such capabilities, inherent in art, punctuate a space. From author John Updike: “What art offers is space—a certain breathing room for the spirit.” Work is brass and art bends it. Art is therapy to work’s tactics. Art orients workspace toward becoming a workplace: mysterious, ambiguous, chaotic, messy, insightful—like art.